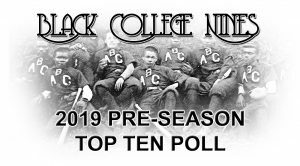 After finishing the 2018 season being crowned Historically Black and University (HBCU) Baseball National Champions, both North Carolina A&T University, in the large school division, and Albany State University, in the small school division, sit atop the 2019 HBCU Pre-Season Top Ten Baseball Poll. The Aggies, one of six Mid-Eastern Athletic Conference (MEAC) teams in the top ten, return a wealth of experience on both sides of the ball with seven starters including their top two weekend starters. Joining NC A&T in the poll from the MEAC are No. 4 Coppin State University, No. 6 Bethune Cookman University, No. 8 North Carolina Central University, No. 9 Florida A&M University and No. 10 Norfolk State University. Texas Southern University begins the season ranked No. 2 and is one of four Southwestern Athletic Conference (SWAC) teams in the preseason top 10 poll, which includes No. 3 Alabama State University, No. 5 Jackson State University and No.7 Grambling State University. Albany State sits atop the HBCU Pre-Season Small School Poll this year. The Rams have a good mix of returning players from last season’s championship team and will play a tough non-conference schedule. The rest of the small school poll is made up of those baseball programs in the NCAA Division II, NAIA and USCAA, including No. 2 West Virginia State University, No. 3 Florida Memorial University, No. 4 Talladega College, No. 5 Edward Waters College, No. 6 Winston Salem State University, No. 7 Selma University, No. 8 Virginia State University, No. 9 Jarvis Christian College and No. 10 Texas College. Black College Nines is dedicated to preserving the tradition of baseball at historically black colleges and universities with our coverage of HBCU Baseball. For updated won/loss records of all 50 HBCU baseball programs this season and weekly polls, click on the “2019 Season” drop-down menu near the top of the page.